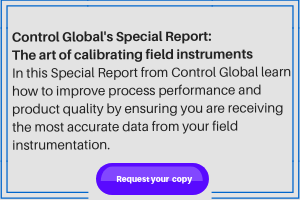 Ask the Experts, on ControlGlobal.com, is moderated by noted process control authority Béla Lipták. Béla and his cadre of leading experts in process automation, recruited from among the co-authors of the Instrument Engineers Handbook 4th Edition, are in the box all month answering process control questions from all comers. The best will be published here. In order to eliminate misunderstandings, please include P&ID sketches using ISA symbols with your questions. Q: I am preparing an instrument data sheet for a pressure transmitter and a differential pressure level transmitter. I have to select the calibration range for these instruments. Could you explain to me clearly about the calibration range and how to specify it. A: The table to the right shows some typical d/p cell ranges for both pressure and level applications. At the bottom of the table, you will see the minimum and maximum limits on suppression and elevation. Whenever the d/p cell is at an elevation other than the nozzle on an atmospheric tank, the zero of the d/p cell needs to be elevated or depressed. It is important to realize that two zero reference points exist. One is the level in the tank, which you want to consider as the minimum allowable level (Y in Figure 1 = lower range value) when the tank is near empty. The other zero reference point is the point at which the d/p cell experiences a zero differential (zero value of the measured variable). The terms “elevation” and “depression” refer to the zero experienced by the d/p cell. All d/p cells can be provided with zero, span, elevation and depression adjustments, either mechanical or electronic. The terms elevation and depression refer to the zero experienced by the d/p cell. On the left side of the figure I show mechanical spring adjustments to physically illustrate the relationships. Equivalent electronic adjustments are available. In both cases, the overall available span must be wide enough to encompass the required adjustments. The tension in the elevation spring can be set to cancel out any initial pressure exerted on the high side of the diaphragm capsule. Similarly, the depression spring can be adjusted to compensate for initial forces on the low-pressure side of the d/p cell. The amount of depression setting is limited to the full range of the capsule, whereas the sum of elevation setting and span cannot exceed the full range of the cell. These settings are normally adjusted in the factory if sufficient data are furnished to the manufacturers. If the setting is changed in the field, it will affect the span. Figure 2 shows a dry-leg d/p cell installation with the desired minimum and maximum liquid levels noted. The output of the transmitter will be zero when the level is at the minimum and 100% when it is at the predetermined maximum. The span (range) of the cell will be product of liquid density and the distance between minimum and maximum levels desired (X). The elevation spring will be set for the product of density times distance between the minimum level desired and the cell datum (Y). A reference leg is also shown on this sketch, which is convenient for checking the transmitter. Checking is done by temporarily isolating the cell from the tank and filling the reference leg with a known gravity fluid. Once this figure is obtained, the repeatability of the unit can be checked periodically. The right side of the figure shows a wet-leg installation. Span is determined the same way as before (X×SG1). Range depression is calculated as the difference between the hydraulic head in the wet leg (ZSG2) and the range elevation (YSG1) desired. The difference between process and filling fluid densities must be selected such that the depression does not exceed the limit given in table above. For example, if the desired minimum level is at the cell datum line (Y=0), the difference between maximum and calibrated span is 200 in. (5 m) of water column, and the height of the wet leg is 100 in. (2.5 m), then the density of the filling liquid cannot be more than 2. The actual span setting of the cell can be anywhere below the full range. Q: I am an office-based electrical and electronics engineer working in an instrumentation firm. Can you suggest good books about instrumentation? A: Being an author/editor myself, it’s hard for me to give you an unbiased answer, because I naturally like my own books, such as the three-volume Instrument Engineers Handbook. Volume 1 deals with measurement and analysis; Volume 2 with control and valves; and Volume 3 with software. I also think that my Optimization of Unit Operations (about $70) is pretty good. Greg Shinskey’s Process Control Systems, 4th ed., 1996, Greg McMillan’s Process/Industrial Instruments and Controls Handbook, 5th ed., 1999; and Paul W. Murrill’s Fundamentals of Process Control Theory, 3rd ed., 2000. Other helpful references include Process Dynamics and Control by Dale E. Seborg, Duncan A. Mellichamp, and Thomas F. Edgar, 2003; Process Control: Theory and Applications by Jean-Pierre Corriou, 2004; and Process Dynamics and Control: Modeling for Control and Prediction by Brian Roffel and Ben Betlem, 2007. For more good engineering books, go to www.controlglobal.com/ATE_books.html. D/P Cell Accuracy; Which Manifolds Are Best?